Like the majority of the British public, I am a massive fan of the BBC sitcom Gavin and Stacey. Also like the majority of the British public, I regularly mourn the fact that there are no plans for a new series in the pipeline. The only place I can find solace is in the favourite food of Stacey’s mum Gwen – in a thick, fat, generously stuffed omelette. Now, as a vegetarian, I may be biased, but to me there’s nothing better than an omelette full of soft, crumbly potatoes and sweet, caramelised onions. However, this omelette is also exceptionally tasty when topped with a handful of cheddar, or (I’d imagine) a sprinkling of crispy bacon or pancetta. This is a basic recipe that can be adapted to your own weird and wonderful tastes, but make sure you leave enough room for the beauty of the original flavours to shine through. 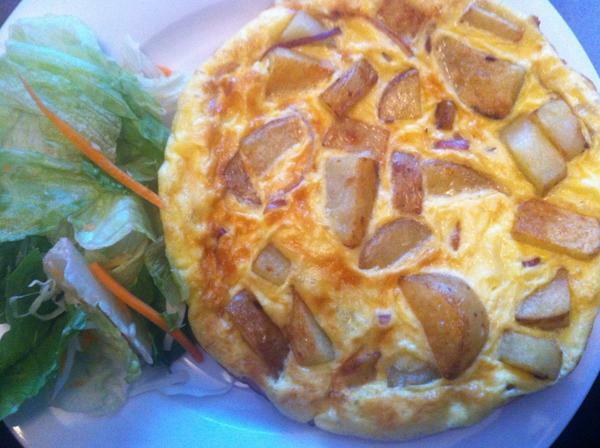 This entry was posted in Recipes and tagged eggs, omelette, onion, potato on November 26, 2012 by eleanor.